Nine-month-old girl found dead on Surfers Paradise beach. Police have arrested the parents of the 9-month-old girl found dead on a Gold Coast beach. The parents of a nine-month-old girl found lifeless on the beach at Surfers Paradise were homeless and raising their family on the streets. The infant was found unresponsive on the edge of the surf near Staghorn Ave about 12.30am on Monday. Despite desperate attempts, police and paramedics were were unable to revive her. The girl’s 48-year-old father and 23-year-old mother are being questioned in police custody after being found about five kilometres away in Broadbeach. Police confirmed the couple are known to them and do not have a fixed address. The family has been living in parks and seeking shelter from Tweed Heads to Surfers Paradise. The girl had not been reported missing before her body was found. Detective Inspector Marc Hogan said the scene was traumatic for everyone involved. “This is a very tragic event. It’s a very sad situation,” he said. Insp Hogan said it appeared the girl had been in the water, but there were no obvious wounds or injuries. “Not that I could see,” he said. A passer-by found the child’s body at the edge of the surf and raised the alarm but police say paramedics never stood any chance of reviving her. Insp Hogan described the beach where the girl was found as “not your typical crime scene”. He said a ground and air search had yielded little evidence, with the lack of physical evidence giving “some indication of what may have happened” – a suggestion the child may have drowned. Homicide detectives from Queensland and NSW police are involved in the investigation. NSW officers have been brought in to pin down potential movements of the couple between Tweed Heads, on the NSW side of the Queensland/NSW border, and Surfers Paradise. Insp Hogan said they had been staying on the Gold Coast but did not say for how long. 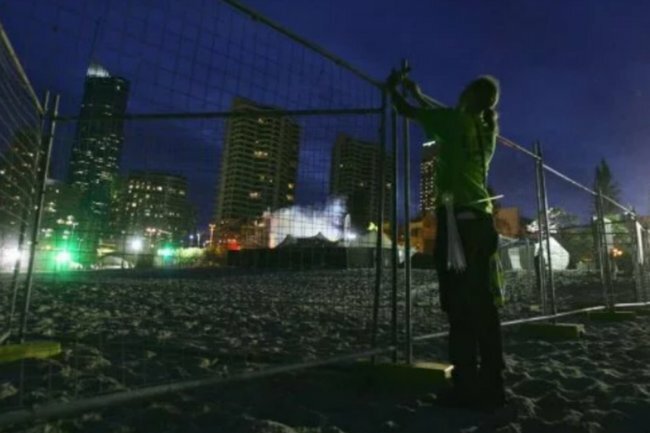 The baby was found less than a kilometre from the main party precinct for schoolies revellers. But police have ruled out any connection to the end of high school celebrations, and it wasn’t a school leaver who found the child. Detectives are checking CCTV footage in the hope the couple and child may have been caught on camera. A post-mortem examination will be conducted on Monday.